DUG Insight User ManualFrequently Asked QuestionsFrequently Asked Questions WorkflowsHow to interpolate RMS values on a 2D horizon? In the Map View, select to display the 2D horizon which you want to create the ghost horizon. Ghost the 2D horizon to the top and bottom of the interval that you want RMS over. At Amount (ms), a negative value will place the ghost horizon above the original horizon and a positive value below. Note: The Ghost button will be disabled if the horizon you are using in the operation is pending on another operation such as propagation. You will see a notification of the pending operation that you should complete before continuing with the current operation. When the ghost horizon has been generated, click Save as New Horizon to keep the horizon. From the Operations tab in the map view, select Amplitude Extraction at Operation. At Top and Bottom, select the top and bottom horizons (ghosts) between which Insight will extract the amplitude. Select the input volume for the operation at Volume. At Property, select RMS as the extraction method to be used in the operation. Click Run to run the operation. Note: The Run button will be disabled if any of the input horizon you are using in the operation is pending on another operation such as propagation. You will see a notification of the pending operation that you should complete before continuing with the current operation. When the operation is completed, select Create new to save as a new horizon. Tip: Click on the Help icon to read more information about this operation. In the Map View, select the extracted RMS as the Horizon. From the Operations tab, select Regrid at Operation. At Output Survey, select <<X/Y>>. Regrid the extracted RMS with a small enough increment to honour the CMP bins. 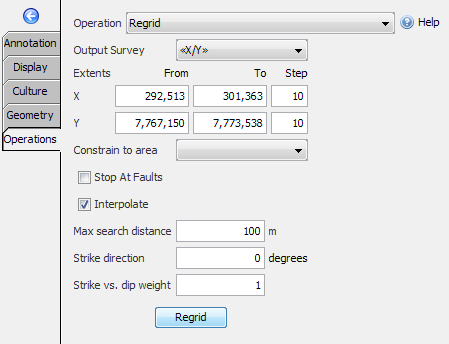 Clear the Interpolate check box, or use a small search distance. Note: The Regrid button will be disabled if the horizon you are using in the operation is pending on another operation such as propagation. You will see a notification of the pending operation that you should complete before continuing with the current operation. Once the horizon has been processed, select Save as New Horizon. Note: After regridding, the interpretation may appear very small. Zoom in to confirm regridding occurred. 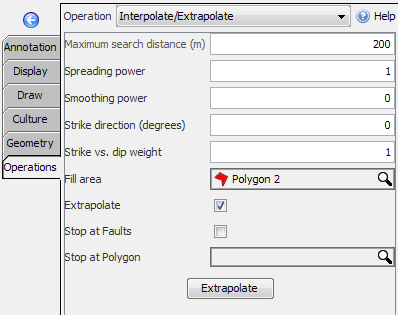 From the Operations tab in the map view, select Interpolate/Extrapolate at Operation. At Fill area, select a polygon to constrain the area to fill with the selected polygon. Note: The Extrapolate button will be disabled if the horizon you are using in the operation is pending on another operation such as propagation. You will see a notification of the pending operation that you should complete before continuing with the current operation. Select Replace this horizon or Save as New Horizon to keep this horizon. This should generate an interpolated RMS map. Prev: How can I created a layered result from many different input volumes merged at horizons? Next: How do I make an isopach or isochron map in Insight?